Feeling festive in “the City by the Bay” is a real San Francisco treat! With ice skating, gingerbread houses, sugar castles, Santa visits, and neighborhoods twinkling with lights, a trip here during the holidays is a perfect getaway. 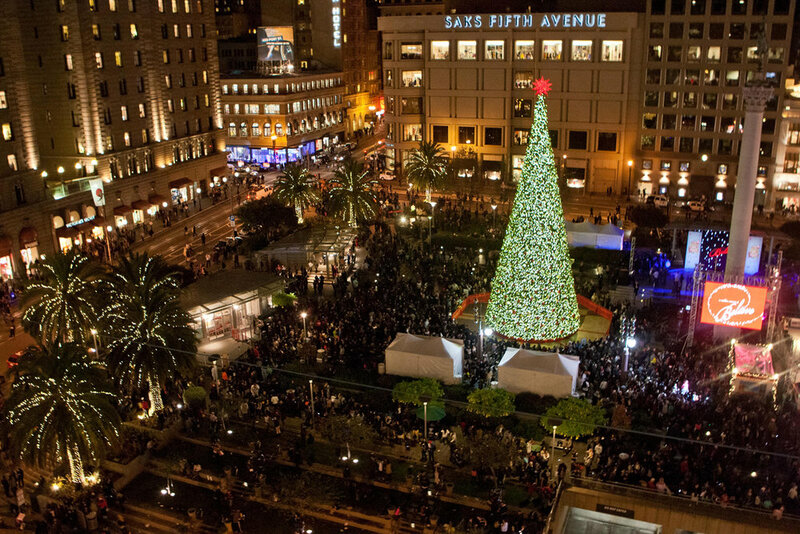 To get into the holiday spirit, we always start at Union Square. There’s something so special about a giant Christmas tree with the accompanying “ooohs” and “aaahs.” An inviting ice skating rink (333 Post St.) sits right beside the tree, complete with friendly penguin gliders to help the littlest skaters. Head across the street from Union Square to Macy’s (170 O'Farrell St.), where you can press your nose to the glass and look at the creative holiday window displays. Then hop on the elevator to see the big guy upstairs. KidTripster Tip: The earlier in the season that you visit Santa, the better for avoiding long lines. And be forewarned: Macy’s has all of its ornaments on display in this area - an irresistible tactile tour for little ones - as well as toys and a Build-A-Bear workshop. KidTripster Tip: Another option for ice skating is the Bay Area’s largest outdoor rink at Embarcadero Center. Bonus? The four iconic buildings will be sparkling with 17,000 holiday lights. It’s a sight to see! This rink is open early November through early January. Cost: Youth (Under 8) $7; Adult $12, Skate rental $5. The Westin St. Francis San Francisco on Union Square (335 Powell St. ) will leave you with sugar plum fairies dancing in your head for the rest of the month. Walk into the lobby, and your kids will be delighted by all the decorations. But the real showstopper is not one - but two - unique castles. The Sugar Castle is a hotel tradition, originally created in 2005. It resembles a French chateau and was inspired by the hotel chef’s travels. The St. Francis Enchanted Castle is 12-feet tall and features a wintery scene with presents, colorful candies, and elves scaling the castle walls. Both castles are meticulously handcrafted works of sugar art. The display runs through early January. Trust me, you won’t be disappointed! The hotel also has a popular Sweet Boutique to satisfy your kid’s sweet tooth - freshly-baked cookies, orange-scented shortbread, and of course, gingerbread men. The Sweet Boutique is only open on the weekends from late November to late December. Is there a sweeter tradition than holiday tea with little ones? Fairmont San Francisco (950 Mason St.) is a gorgeous hotel atop Nob Hill which also does it up for the holidays. It has an enormous gingerbread house made with thousands of little gingerbread bricks, complete with frosting and candy decorations. Sit and sip, enjoying the small details during the Gingerbread Holiday Tea. Prices start around $70 for kids and $100 for adults, depending on the day; seatings are at 1:30 p.m. and 3:30 p.m. Yes, it’s expensive but memorable. If you’re visiting "the City by the Bay,” you’d better get to the water. The Fisherman’s Wharf Community Benefit District and St. Francis Yacht Club host a holiday boat parade with more than 60 vessels. A holiday tradition for more than 20 years, this event occurs in mid-December. KidTripster Tip: For the best views, head to Aquatic Park, Crissy Field, the Marina Green or Pier 39. As far as I’m concerned, the holidays wouldn’t be complete without a performance of The Nutcracker. There’s something so magical about watching my daughter’s eyes light up when the Sugar Plum Fairy twinkles her toes across the stage. If your kids can sit for it, the San Francisco Ballet puts on a spectacular performance. (Little known-fact: Tchaikovsky’s version actually made its American premiere at the San Francisco Ballet on Christmas Eve in 1944. It’s been a big draw ever since!) Performances run from mid- to late-December. Tickets start at around $25. KidTripster Tip: Look for discounted family performances during the week. Meghan Kalkstein is a former journalist living in the San Francisco area with her husband and two children. When she’s not chasing kids, you can catch her wielding a hot glue gun, sewing or crafting.